Click here to shop thousands of additional promotional products. Price includes the first color/location run charge. Our ATM Machine stress ball is a great promotion when you need a quick fix! 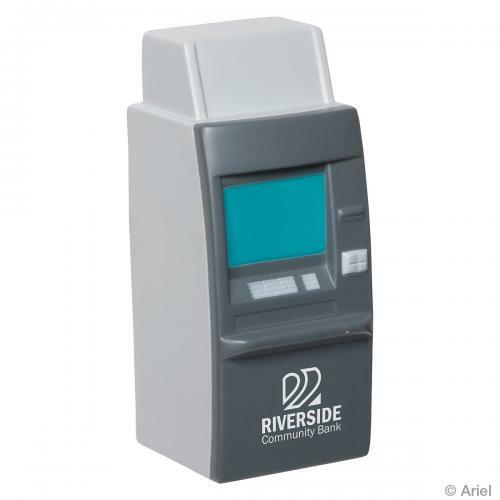 You can custom imprint an ATM machine stress reliever with your business message and/or logo. Hand out these ATM machine stress balls at banking promotions and industry shows. Item Size : 1-7/8" x 4-1/8" x 1-3/4"
Imprint Area : BK-1-1/4 x 2"_ SIDES 1-1/8 x 2"_ TOP 1-1/8" x 1/2"_SCREEN 3/4" x 1/2"
5 working days from art approval + shipping. We offer free 3-day rush service for this product. 3-day orders must be submitted by 2 PM EST. If you are requesting rush service the following parameters apply: (1) Catalog quantities only. (You must order a quantity between the minimum quantity and maximum quantity shown in the price table.) (2) One color, one location (side) imprint only. (3) We will provide an art proof on a 3-day rush but you must be available to approve the proof by the time/date indicated in the email. Failure to approve the proof on time, or any request to make changes, may delay your order. (4) Artwork must be submitted in a usable format (see Art Requirements below). Stress balls have a small imprint area. Therefore, we reserve the right to edit your artwork for best fit. We will typeset a text-only imprint on a rush order but the layout of text and text font will be left to the discretion of the art department. (5) Based on the time of day you submit your order we will ship 3 or 4 business days from order date. (6) Rush service refers only to production time and does not include ship time. Unless you specify otherwise, all orders ship via UPS or Fed Ex ground. Depending on where your order is shipping from and to, ground shipping to most parts of the United States is 1-5 business days. If you need your order by a specific date we urge you to contact us for assistance in how to proceed. PLEASE READ! WE OFFER RUSH SERVICE WITHIN THE CONTINENTAL UNITED STATES ONLY. We encourage customers in Hawaii and Alaska to contact us for a ship quote prior to ordering. We cannot ship to a PO Box. Although we offer rush service, it cannot be guaranteed. During periods of high order volume, our suppliers may suspend rush service for temporary periods of time. If rush service is not possible a customer service representative will contact you. If we have any questions or concerns about your rush order and are unable to contact you, we reserve the right to not proceed with your order. If you are not in a rush to receive your order, we encourage you to go with standard production time. This allows you time to receive and review an art proof before production. Art Requirements : Camera ready artwork 600 dpi resolution or higher. File format: High resolution JPG or Adobe Illustrator vector format (.eps or .ai). No placed images & all text must be converted to outlines. If you are unsure of your artwork you can email it to us for review. If unable to provide usable art we can fix your art file for a minimal fee. For a text-only imprint you do not need artwork. Use the special instructions box on the order form. Free eproof on non-rush orders. On re-orders placed within one year from previous order date which require no artwork changes. $15.00 on re-orders placed after 12 months of prior order date, and no artwork changes. After 24 months a new set-up charge will apply. Ink Change Charge: $20.00/change. If you are printing the same artwork or copy on a stress ball, but purchasing assorted colors of the stress ball, you may incur this charge if you need to print in different colors. Minimum quantities per color may be required so please contact us for more information before placing order. Metallic Ink Charge: add $0.20 cents per unit. Metallic silver and metallic gold imprint colors are available and listed as stock imprint colors. You will incur the metallic ink charge of $0.20/unit if you select one of these imprint colors. PMS Color Match: $50.00. If a specific imprint color is required that is not a listed standard imprint color, you will incur a $50.00 fee per match. Exact matches cannot be guaranteed. You will incur this charge each time you re-order. Over/Under Runs: for quality control purposes all orders are subject to a 5-10% over/under run. Customer will be charged for quantity shipped. Drop/Split Ship: $10.00/address. Add $10.00 hadling fee for every ship address after first. Emailed art proofs: FREE. We provide the first emailed art proof at no charge. Changes requested by customer may be charged at $10.00 per revision. Product color, design, texture, and/or density may vary with inventory replenishments. Imprinting methods used are adjusted by hand-eye coordination. While every effort is made for inventory and imprint consistency, a totally uniform inventory and imprint on each piece cannot be guaranteed. Blank Goods (No Imprint). You may order this item without an imprint. You must order at least the minimum quantity shown in the pricing table. You will incur the unit cost + shipping. Blank goods ship in 1-2 business days from order date upon confirmation of stock. In Step 1 on the order form below check the box for blank goods. Our products are safety tested and meet U.S. market standards for promotional products. Stress balls/ stress relievers are a promotional product and they are intended for adult use, and not intended for children under 12-years of age. CPSIA (Consumer Product Safety Improvement Act) testing is completed on various products. CPSIA is not pre-labeled on most items. Orders intended for children 12-years or younger require a CPSIA tracking label imprint in order to be in compliance with CPSIA. Additional charges may apply. A set-up charge is applied for every color and location imprint. A run charge is applied for every additional color and side after the first color on the first side. Stock imprint colors can be found on the Item Details tab. Should you require a specific color match that is not a stock color, you may incur a fee. Fees can be found on the Fees & Charges tab. If there is a charge, you will incur this charge for every PMS color match. 100% exact match cannot be guaranteed. If you need a PMS match, select the color "PMS Match" from the imprint color(s) drop-down box below. Note your PMS color(s) in the special instructions box. *Only use this field if you must receive your order by a certain date. (2) One color, one location imprint only. (3) We will provide an emailed art proof for a 3-day rush order. You must approve the proof without any change requests by the date/time specified on the proof to avoid delays. (4) Based on the time of day you submit your order, we will ship a 3-day rush: 3 or 4 business days from order date depending on when order is received.This does not include ship time. If rush service is not possible a customer service representative will contact you. This site is owned & operated by Buy Promos, LLC. To shop more promotional products: Budget friendly promotional products from BuyPromosOnline.com. Copyright © 2001-2019 Buy Promos, LLC. All Rights Reserved. Website Design by Burgeon Software LLC.